Get your hands on two of the hottest trends captivating little girls' hearts - unicorns AND rainbows! 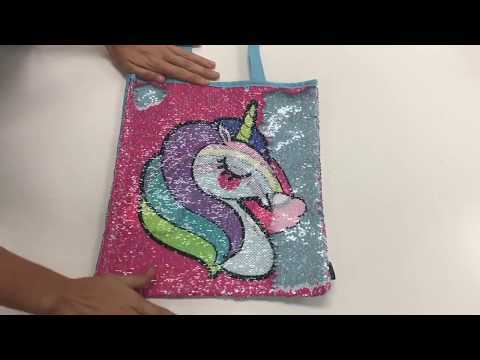 This bewitching tote bag is perfect for tactile fidgeters and sparkling princesses alike. All you have to do is pass your hand downward along the sequins to reveal a blushing, napping unicorn against a bright pink sky, then swipe up for a rainbow set against soft blue. Lovers of all things enchanting will delight at this shimmering, glittering sequined tote! It's big enough to fit school books, outfits for a sleepover, make-up essentials, and a sizeable amount of fairy dust. The 9" shoulder strap makes it easy for this bag to grow WITH you as you get older. Whoever said you had to choose between a rainbow and a unicorn? Size: 13.5" x 1" x 14.5"
Shimmer Flip Journal - Magical! Brush the sequins to create beautiful, glowing aqua covers.